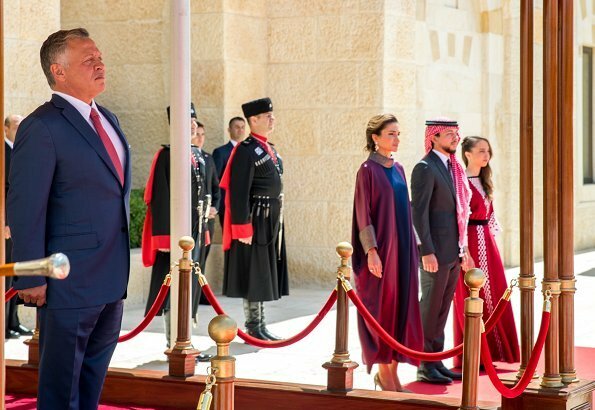 On May 24, 2018, King Abdullah II, Queen Rania, Crown Prince Hussein and Princess Salma of Jordan attended the national celebrations of the 72nd anniversary of Jordan's Independence Day held at Raghadan Palace in Amman. The country won its full independence on May 25, 1946, following the end of the British mandate. Independence day, the whole Family is together. I did see Pss Muna mother of the King in a video she wore lilac. Everyone looks good. With the Headgear the CP looks so much like his Grandfather the late King Hussein when he was young. Wow!! what a beautiful outfit. 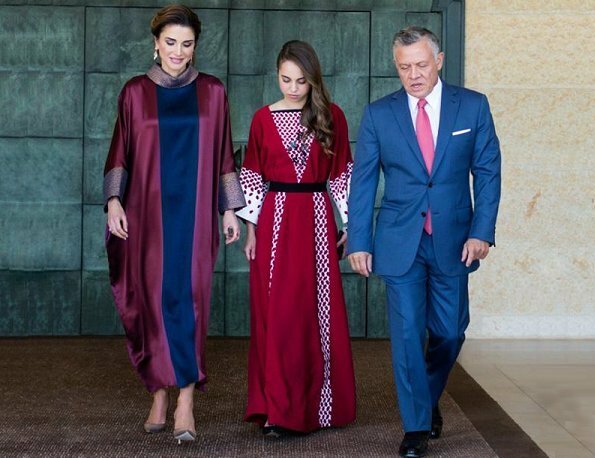 I really like Princess Salma's dress, but Queen Rania's, although lovely colors, needs shape. It looks very much like a European or American academic robe to my eyes, but I guess it may not appear that way to people in the Middle East. I presume that this kaftan like dress has some approach to the traditional style. I think it would have looked better in floor length and with mules instead of the pumps, that don't work with the traditional style. But the colors are beautiful, so is the neckline and sleeves. I like how the colors match with the suit and tie of her husband. Hair, make-up and earrings are superb. What a classic beautiful face she has! The colors are beautiful on Rania and while it may be a style for her country, it does rather like a choir robe. You know a lot of men wouldn't like to have their wives taller than them, but King Abdullah clearly doesn't not care. I love that! And my goodness, the Prince and Princess look so amazing, just like their parents. I admire King Abdullah and always enjoy listening to interviews to him. The plus to his knowledge is that he is so self-confident and strong. Height would never bother that man. Does anyone know why the crown Prince has the head gear but not the king? Just curious. They all look good. Abdullah and Rania are a very cute couple.